An old and rusty mine has washed up to a beach in Karasu, a small town at the Black Sea coast. 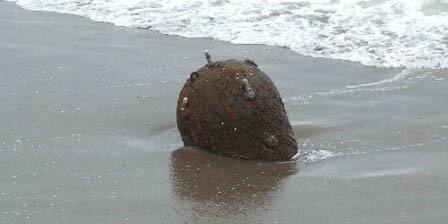 Locals alerted the police, and police asked Navy for help to identify the object. After the investigation of navy the object was identified as a very old mine. Naval EOD teams were called to destroy the mine. The experts were not able to determine the exact model and the nationally of the mine. There is a sunken German submarine U-20 a few miles off shore. Maybe this mine was a part of her deadly cargo. More to read: Here and here.